A beautiful 2014 Riesling just hones in on the very special place occupied by the Mosel Region in the world of fine wines. We are regularly asked why we spend so much of our free time visiting the Mosel and writing about its wines. This 2014 Riesling is a gorgeous outstanding wine but no “100 pointer” or on the list of “100 wines you have to drink before you die.” Yet it epitomizes everything great about Mosel and hones on all the reasons why we do all this. It has immediate appeal and yet it is deep at the same time. It is packed with flavors and yet light on its feet. It offers also great complexity if you wish to “go deep” into the wine: You can spend hours, getting new nuances of fruits, minerals and herbs. And yet this wine will not have cost you more than €11 at the Auction last September (+ VAT and delivery costs to your country), a ridiculously low amount given the raw materials: The wine was made from over 100 year old un-grafted vines, fermented with ambient yeasts and aged in traditional oak casks. The region is full of such great wines, which come from stunning steep terroir, old vines and which thrill the senses for little money. This wine is fruity-styled, but the same is true for dry wines as well. 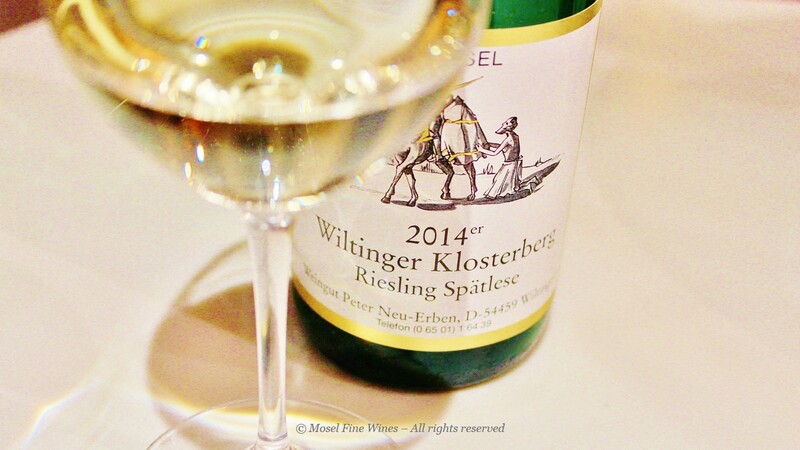 However, the vintage plays a role as well: 2014 is made for Riesling lovers. We cannot repeat this often enough: At the top, it is a stunning vintage not seen since the 1990s. So go out and get yourself some (2014) Mosel wine! This wine may not be available in your corner of the earth, but others are. If we can be of help, we are happy to send you our Issues, which are available on a free of charge subscription.